Whenever bloggers report an unpleasant news, the first reaction we receive is insult and denial from not just the individuals involved but also their fans. When we reported that Yvonne Nelson was pregnant, we received a lot of bashes from her fans and her friends that it’s not true. Yvonne herself came out to deny it. Guess we all know how it turned out. We again reported the Afia Schwarzenegger’s marriage was over and that the husband caught her red-handed being bonked by another man and recorded it, Afia came out strongly to deny it and even threatened to sue. We all know how it turned out. When we reported that Stonebwoy’s wife Dr.Louisa Ansong was pregnant, Stonebwoy and his squared came out to deny and issued threats and called bloggers names. Just a few days ago, Stonebwoy revealed he is now a daddy…smh. Well, we will keep bringing you the gist and the gossip in town no matter what. 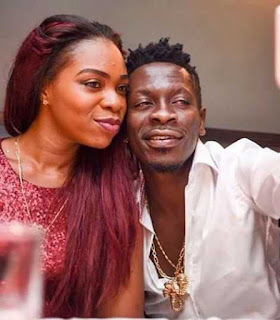 The new rumor circulating has that, Dancehall King, Shatta Wale has thrown out his baby mama, Shatta Michy from his house over cheating allegations. Dawuroo.com is working around the clock to have this unfortunate news verified but we trust sources and our source tells us it’s a fact that Shatta Michy is currently not with Shatta Wale because Shatta Wale caught her cheating on him. According to the reports, Dawuroo.com gathered, Shatta Michy is currently staying at Sonant Court Hotel in East Legon, Accra and has been there for the past 5 days.